Pharaoh Hound, A Natural and Playful Companion! The lineage of the Pharaoh Hound, like some of the other hound dog breeds, can be traced to ancient Egypt around 4000 BC. Paintings in tombs have recorded this dog's existence, as well as its abilities and elegance. The Pharaoh Hound is a versatile hunter, using skills of both sight and sound, coupled with power and agility. As such, they became much revered as faithful companions to kings and accompanied them on hunting expeditions. At some later date, they traveled to Malta with Phoenician traders and have since been established there as the national dog of this island. To this day, there continues a debate about the origins of this breed, so you will no doubt find different accounts of its history. The appearance of this handsome breed is marked by an alert expression and erect ears, along with a sleek and powerful-looking physique. A characteristic of the dog is that when excited, the ears and nose become flushed with a deep pink color, similar to blushing. Color variations: Tan or Rich Tan with occasional white markings on the chest or tail. The Pharaoh Hound is a clean dog with no odor. It has a short and glossy coat which needs only minimal attention. A rub down with a rubber brush will do the job, along with only an occasional bath. This breed has a happy and playful personality and is easy going and friendly. It also has an independent nature, which most probably relates more to its activities and strong instincts as a hunter. Intelligent and obedient, training should not be difficult. However, they respond best to positive reinforcement, not harshness. They can become bored with repetition, so creativity and variety will keep them more focused. 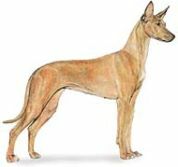 Pharaoh Hounds are a very active breed and should be given plenty of exercise on a daily basis. The treadmill shown above can provide an excellent alternative addition to your dog's fitness routine when other forms of exercise are not available due to weather or family schedules. Additionally. if you can provide an opportunity for frequent runs in a safe and securely fenced area , this would be ideal. Nowadays, many dog parks do provide such areas which are also separated into areas for various dog sizes. This breed, while fairly quiet inside the home, enjoys being active and will do best in a home with room to run outside. Pharaoh Hounds are very agile jumpers so perimeter fencing should be high and secure. Loves attention and does well with more mature children and is accepting of other dogs in the household. Exercise requirements would probably rule this dog out as the most suitable for a sedentary owner. However, they have been used as therapy dogs to cheer up patients and the elderly in various institutions. Swifter Than The Arrow, examines the evidence that hounds living today - including "Pharaoh Hounds" - are directly descended from those that were bred for the chase in ancient Egypt around five thousands years ago. This fascinating book further celebrates the Egyptians as the first known civilisation to have formed the most remarkable and enduring of human-animal relationships. And, remarkably, how they kept the breed true over twenty-five centuries - during which time many notable achievements were being completed including building of the pyramids and the invention of hieroglyphs. A unique dog bed for your dog's unique house.